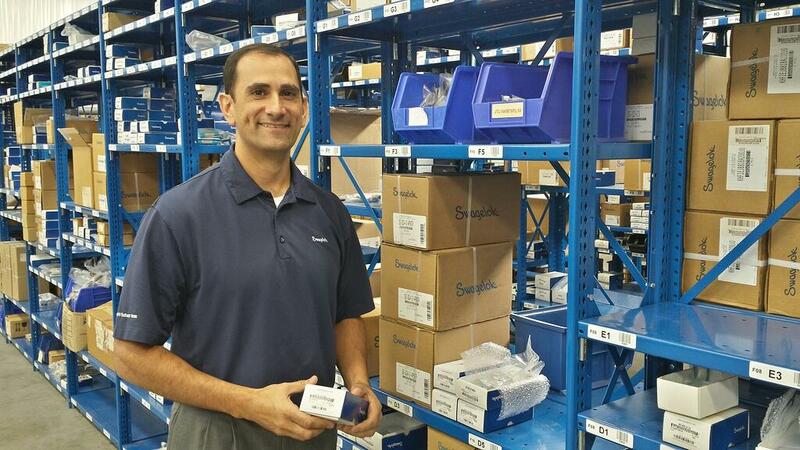 Brian Cianciolo is the Director of Continuous Improvement & Fulfillment at Swagelok Southeast Texas (SSET). Brian joined SSET in August of 2010 after working at Swagelok's corporate headquarters in Solon, Ohio as the North American Distribution Manager for twelve years. Many of the strategies and processes Brian incorporates enable Swagelok Southeast Texas to optimize internal performances with the end goal of delivering value to customers. Having clear strategies that result in eliminating inefficiencies; improving quality, productivity and accuracy, help the company respond to customer's needs. Brian plays a vital role in effectively deploying continuous improvement and lean processes across our three sales and service centers. Q: How do you utilize lean inventory management in the warehouse to drive process improvements and cost savings in today’s competitive environment? Q: How do the improvements in the warehouse play a role in the customer’s experience? Q: What other strategies and Continuous Improvement concepts do you employ that focus on providing solutions to customer’s fulfillment problems? Brian: “To name a few, we utilize, Collaborative Replenishment, Bar Code Scanning, Warehouse Data Profiling and Anti-correlation. For Collaborative Replenishment, we work with Swagelok Corporate to analyze our buying and selling patterns with a keen focus on our customer sales patterns. As we distribute a particular SKU/part number over a specified time period, our system will automatically begin stocking and replenishing it at the “right” levels and frequency. This process takes all of the guess work out of our purchasing process and frees up Swagelok machining capacity. Manufacturing can reallocate labor and equipment to manufacture factory special components and standard products below safety stock levels or nearing a low stocking position. This helps to ensure we are being replenished locally with inventory our customers need and expect us to keep in stock. Our line item refill rate is 97% which means when our customers order a line item, we have it in our local inventory, ready for pick up or shipment, 97% of the time. Because the Collaborative Replenishment system knows exactly what is on our shelves and automatically plans stock levels we are able to fulfill our up front customer promises. In addition, we are able to carry a wider breadth of our Swagelok product offering, resulting in significantly reduced customer lead times. Bar Code Scanning helps improve quality measures and speed of transactional data. We use electronic barcode readers to verify that we are pulling the right part, from the correct location. Warehouse Data Profiling is the analysis of transactional data at the SKU level to help forecast warehouse activity, determine storage strategies, design warehouse layouts and work flow processes. It is right-sizing the warehouse and inventory to maximize operational efficiencies. Q: Your continuous improvement and fulfillment expertise you have shared really streamlines the ordering process for the customer, resulting in a satisfied customer. How can others in a similar role as you tap into these improvements and best practices? For more information email Brian or call 281.422.3533.